“I could not name many [players] who had so many outstanding qualities.” These were the words of the great Gordon Coventry when asked to describe a player we honour as an Icon of Tasmanian Football. A player to whom every great skill in the game came as naturally as breathing, Laurie Nash is still revered as one of football’s greatest talents more than 70 years after his last game. Lawrence John Nash was born in Melbourne on May 2nd, 1910. He came from a prominent sporting family, with both his father and grandfather having played VFA/VFL football. 1930 Adelaide Carnival, a tournament in which he was adjudged as Tasmania’s best player. He would also represent the NTFA on 10 occasions, and showed the first signs of his future stardom as a forward when he booted 11 goals in a match against the NWFU in 1932. Back with City, Nash played a key role in the club’s NTFA and State premiership triumphs in 1930 and 1932, while individually he claimed back-to-back City and NTFA Best and Fairest awards in 1931 and 1932.
departed the club in 1941 when WWII saw the VFA competition suspended. 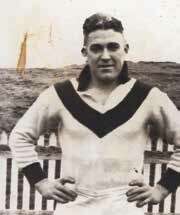 After enlisting and serving in New Guinea during the war, Nash returned to Melbourne in 1945 and was convinced to have one last crack at VFL football with South Melbourne. Now 34 and struggling with bad knees, Nash was nevertheless still a fine player, topping South’s goal-kicking list with 56. His 99th and last VFL game came in the 1945 Grand Final, a spiteful encounter against Carlton still known as ‘The Bloodbath’. Nash subsequently retired to take on coaching roles in the country, achieving the remarkable feat of coaching two clubs – Wangaratta and Greta – to premierships in the same season in 1946. His last official role in football came when he returned to South Melbourne for one season as coach in 1953. Nash maintained a strong connection to football in later years, writing columns for the Sporting Globe (amongst others) and appearing on television shows such as World of Sport as a football analyst. posthumously acknowledged with his inclusion in no less than four Teams of the Century, as well as the Australian Football Hall of Fame. Viewed as an icon of the game overall, he is now officially acknowledged as such in the Tasmanian Football Hall of Fame.